Way back in the 1990s companies such as Prodigy, Earthlink, AOL and Yahoo were in a race to become your online “portal” — the single-stop-shop for you to get on the internet. The buzzword of the day was “stickiness,” meaning if you made your web site sticky, customers would return again and again. About 2000 Google killed these arrogant hopes with its brilliant search engine, since then the main way consumers move online. Yet guess what? The portal play is returning on mobile handsets. 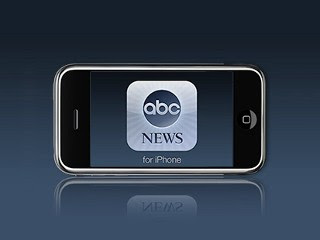 ABC News makes the latest bid with yet another “app” button for your iPhone. (Apps, on smartphones, are downloadable programs that allow users to leap online with a simple tap, and like the portals of yore create new opportunities for single content producers to try to make consumers stick.) ABC News has a nice offering, using the built-in GPS service in the iPhone to provide a feed of local news and weather … and hopefully get consumers to stick around for 20/20, Charles Gibson and all the corresponding ad impressions. Funny thing is, this time portals may work. Standard web browsers look horrible on most cell phones, and one-button mobile apps give you just the content you want — weather, NY Times, Facebook — with one simple click. Pew notes that by the year 2020 (no connection to ABC!) mobile phones will be the most common tool for consumers getting online. You can almost hear Google gasp in frustration as the big PC browser that made its ad model so powerful starts to fade from tiny handset screens. How this shakes out is anyone’s guess, as every content producer tries to create the ultimate single-button-widget for your handset. It also creates a devilish question for marketers — if you miss the right portal, you may get shut out from consumers, so which of the millions of potential online apps do you pick? It’s all enough to make you hope Google creates a simple mobile operating system.